Faith-based television in Canada is facing a major shake-up, with the takeover of several channels this summer. ZoomerMedia made the offer to buy the channels, including VisionTV and JoyTV, in June 2009. However the purchase was only approved by the Canadian Radio-television and Telecommunications Commission (CRTC) on March 30 of this year, and the sale was finalized this summer. The sale raises questions because Zoomer Media is a secular, for-profit corporation which markets to people 45 and older. 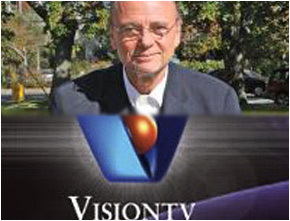 The primary asset involved is VisionTV, a ‘multi-faith channel’ launched in September 1988 that is available, via cable and satellite, to over 9 million homes across Canada and attracts 1.6 million viewers each week. The deal includes control of another cable channel, One: the Body, Mind & Spirit Channel, which offers programs on exercise, meditation, yoga, natural health and living a planet-friendly lifestyle. The deal also includes two conventional channels, JoyTV 10 in the Vancouver area and JoyTV 11 in Winnipeg. They were started by Willard and Betty Thiessen, who had founded the evangelical Christian program It’s a New Day. The stations were later taken over by media giant Rogers and then sold in 2008 to S-VOX, a non-profit organization which already owned VisionTV and One. S-VOX and its assets were bought for $25 million (although auxiliary costs may push the total closer to $30 million). The purchaser, ZoomerMedia, is a conglomerate that specializes in marketing to ‘zoomers’ (baby boomers with zip). ZoomerMedia’s holdings also include Zoomer Magazine, 50PLUS.com (a website), Zoomers.ca (a social network site somewhat like Facebook), ZoomerSingles.com (an internet dating site), ZoomerShows (consumer and lifestyle expos in Toronto and Vancouver), CFMZ (a classical music radio station in Toronto) and CFZM (another radio station in southern Ontario). None of the four TV channels has ever been very profitable, but media reports at the time of the purchase suggested that ZoomerMedia’s marketing expertise may turn that around. The prime shareholder and main mover behind ZoomerMedia is Moses Znaimer. In the 1970s and 1980s, Znaimer was a high-placed executive involved with CityTV in Toronto (home of “baby blue” movies) and the CHUM media conglomerate. In this position, he helped launch a string of cable TV channels, including MuchMusic, Bravo!, Space, CablePulse 24, Canadian Learning Television, Star!, Drive-In Classics, FashionTelevisionChannel, BookTelevision, CourtTV Canada, SexTV: The Channel, MuchLOUD and MuchVibe. With ZoomerMedia, Znaimer is continuing to appeal to the same boomer generation, except that both he and the boomer generation have gotten a lot older. Regarding spirituality, Znaimer has a Jewish background — but has never been known for any specific religious attachments. “There’s a lot of money to be made in marketing to boomers,” Bowler suggested, and the purchase gives the impression that “faith is a product” to be bought and sold. While Zoomer may see the channels as primarily a marketing vehicle, that does not mean that the content of the stations will change. Mark Prasuhn formerly worked for S-VOX and is now chief operating officer and content officer of ZoomerMedia’s television division. He told CC.com that while there will continue to be evolutionary changes, the programs on the stations will continue “largely as they have been.” He said that there is “a strong intention on Zoomer’s part to have the faith aspect remain a strong part” of the programming. VisionTV and JoyTV have religious licenses from the CRTC, and Zoomer has assured the CRTC that it will abide by those licenses. In approving the sale of S-VOX to ZoomerMedia, the CRTC considered the question of whether a for-profit company could operate faith-based channels as well as a non-profit organization and concluded that ownership does not matter as long as the stations retain the same programming mandate. Prasuhn also suggested that influence could flow the other way, with a religious component being added to Zoomer’s other marketing platforms. For instance, Zoomer magazine recently put the Dalai Lama on its front cover. As well, Zoomer has added a ‘faith pavilion’ at its ZoomerShow in Toronto (which takes place October 30-31 this year) and to its new edition of ZoomerShow in Vancouver (November 27-28), where faith-based agencies can promote their ministries and services. However, not everything is going to remain the same. Jonathon Roth, executive producer of content for JoyTV in Vancouver, told CC.com that the entire production department at the Vancouver station (including Roth) has been let go. The changes include cancellation of the news interview program The Standard and another program, P3. Ironically, Peter Klein, host of The Standard, has been nominated for an Emmy, to be handed out later this month, for a documentary called Over a Barrel: The Truth about Oil, which was broadcast on 20/20 in the US and on The Standard in Canada. Prasuhn acknowledged that the two programs had not been renewed at the end of their run, but said JoyTV “will continue to carry locally produced programming.” He said British Columbia’s South Asian community in particular has stepped up to fill the gap with new locally produced programming. Underlying the purchase of the faith-based channels by Zoomer is the assumption that they appeal to the same 45-plus market that Zoomer focuses on. If this assumption is true, it calls into question the long-term prospects for faith-based programming and perhaps even the long-term prospects for religion in Canada. “Everything Zoomer does has to do with that market,” Stautland said, “But nobody is projecting that demographic onto those channels. If you look at the ratings for any faith channel, you will see that they appeal mainly to people 50 and over. “The boomer demographic — that’s our audience,” he said. It could even be argued that television, once the epitome of modern technology, is now becoming a domain of the older generation. Surveys show young people spend more time surfing the internet than watching television. Furthermore, Roth observed, “the idea of religion is onerous to young people.” He was at a recent focus group to gather input from young people and when the issue of religion was mentioned, they lost interest in the discussion. The CRTC regulations don’t help either, Roth suggested. Religious stations are not commercially viable, but the CRTC regulations that stations must be multi-faith rather than Christian mean that Christians won’t make donations to them either — they don’t work as businesses, and they aren’t allowed to function as ministries. Prasuhn agrees that the CRTC requirements for JoyTV are “the most challenging and lengthy of any channel in the country” and that Zoomer may seek some modifications when the license comes up for renewal in a year or two. However, he is much less pessimistic about the future of faith-based programming. He said that it is true that only 20-30 percent of Canadians are active members of organized religions, but added that there is also a large percentage who are inactive but still affiliated with a religion. And even those who are disconnected from religion often have an interest in spirituality. Prasuhn suspects that as the Canadian religious reality changes, Zoomer television will continue to adapt to its audience. Noting that VisionTV is available to most English-speaking Canadians, he said the opportunity and challenge is there for VisionTV to be relevant. He added that it is possible since in the last four years VisionTV’s prime time audience has tripled and its overall audience has doubled. Prasuhn also suggested that religion is not necessarily doomed to die out with the passing of the older generation, but that all generations tend to become more interested in religion as they grow older and begin to face issues such as mortality. As well, he suggested that young people may not be interested in religion but they often remain very interested in spirituality. Prasuhn is also not convinced that television is becoming an older person’s medium. While it is true that young people spend more time on the internet, they still do the majority of their video viewing via television. Prasuhn also argued that new media do not replace older media but are added to them. He noted that Christian media ministries continue to use radio and television but also use the internet, social media and videos. “Different media used together can be more impactful,” he concluded — and that is what Zoomer is hoping to accomplish by adding television to its other media formats.